El Séptimo Crío is the hallmark signature of artist César Frey, a signature identity that he created for himself in 2000 to replace two of his earlier signatures. Each signature represents a different stage in Frey’s artistic development, underscoring moments of rupture and accentuating elements of continuity..
Born in Brussels to Asturiano parents, Frey at the age of 10, returned to Spain’s northern region, Asturias, where he spent one year in the small town Piedras Blancas before settling down in Mieres. At only 13 years of age, he won his first competition in Charcoal drawing (Carboncillo), which sparked his curiosity and interest in the plastic arts – a curiosity that over time would turn into an obsession with paint. Self-taught, Frey immersed himself in the mixing of colours and over the course of a year he had learned a variety of techniques (oil, watercolour, pastel, etc…) and had experimented with a range of different surfaces. When he was 14 years old, Frey became immersed in Hip Hop Culture, focusing in on one of its four principal elements – Break Dance. At the end of the same year, he won his first dance competition, which would be a catalyst, compelling his artistic pursuits in Hip Hop culture. Frey first began his work with spray paint (Spray) when he was 16 years old, in Torrevieja (Alicante), where he had spent his summers and where he had done some of his first paintings. To Frey, however, these first paintings were limited to large-scale silhouettes (unfilled) that were done largely in one colour (black), and so he tends to consider them less as Graffiti in the conventional artistic sense and more as his first steps in sketching. Later he would repeat these sketches, always in one tone, year after year, using industrial and automotive sprays that at that time were still not available on the market as legitimate art supplies. Not long after however what is referred to as the First Revolution in Hip Hop collapsed, leaving a profound void in terms of the production and dissemination of fundamental cultural knowledge and materials. In spite of this, and guided by the glorious memories of the first phase of Hip Hop culture in Spain and the indisputable and unbeatable technique of the forever King of Pop, Michael Jackson, Frey went on to win 4 more dance championships, the last of which (won when he was 21 years old) would mark the end of his first intense phase in Hip Hop and signal the beginning of a new one – Paint. Throughout the course of his last seven years in dance, drawing and painting had always been present, flirting with Frey and drawing him in closer. In addition to completing his earlier studies, for the most part totally unrelated to painting, he had also completed studies in Industrial Drafting & Design – formative steps in his enduring passion for painting. Twenty-one years old, Frey dedicated himself to the ongoing learning, which was predominantly self-taught, of contemporary graphic techniques, including graphic design, labelling and airbrushing. All of this was intensified by the arrival of what is called Hip Hop’s Second Revolution, although this too would prove to be short-lived. This second collapse left only minimal representation in the streets, despite which Frey created the signature Jacko 1998, which would be his signature identity for more than half a decade. Still just 21 years of age, Frey launched his first entirely 3D-piece, 45 and 30 degrees perfectly defined. Without a doubt, his technical studies had greatly influenced the finishing and details of this first piece, totally urban and what would become somewhat of a trademark for his later creations. In the years that followed, Frey would complement his artistic work with his studies in architecture and with work that he did for different graphic design companies. In 1997, his signature Jacko 1998 was replaced, signifying a radical change and a critical development towards an artistic phase that would turn out to be much more committed and much more creative. 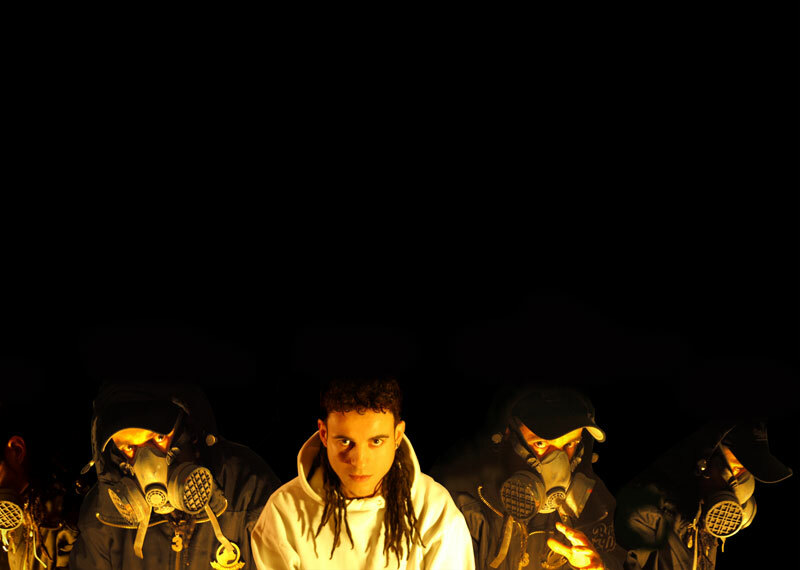 This was a crucial year for Frey, a year that would catapult his artistic career thanks to the knowledge and skills that he acquired in Alicante, and to the artistic relationships he developed with members from the KST Crew (Krasy Style Titan), a group that he would remain deeply committed to, both personally and artistically. In 2000, Frey settled down in Logroño (La Rioja) where he continued to soak up new techniques and experiences, the kinds that can only come from getting to know new cities and styles. Out of these twists and turns, and breaking away from some of his earlier artistic niches, Frey’s new identity signature was born – El Séptimo Crio. A year later, Frey moved back to Asturias, this time to stay. After his return, his new principle concern was to carry revindicative texts into public spaces through the medium of urban art. Without a doubt, this stage of Frey’s artistic development was marked by an acute sense of social unrest and injustice. Almost immediately, however, Frey realized that people would not read these great texts if they were not accompanied by something else and so he set out to do just that through realist murals. Undoubtedly, this move provided an important change: people no longer stopped to just gaze at the “graffitis,” but they stopped to read the entire texts that Frey had added along the sides. He had completed one of his objectives, a difficult objective that had been met with many headaches. Frey had managed to be able to communicate directly in the street without any form of censorship – and without knowing that at the same time he had created his own style where his art was not the only agent of the work, and where the street could be a platform without censorship where the phrase ‘while the media and the government continue to lie, the walls will keep on talking’ would live on. It is true that during these years Frey used painting as a form of social expression, and it was shortly thereafter that he added to his paintings written communication. Since 2000, Frey’s life could be described as growing from an intense obsession into, by the end of the decade, a means of making a living. Immersed entirely in the world of art, Frey has not lost sight of his social convictions or his commitment to social justice and to ongoing collaboration with various not-for-profit causes and events. 2) 2007 Tribute to Frey’s Artistic trajectory. During this event, Frey painted the famous National Geographic portrait of “The Afghan Girl: The girl with green eyes” – his first ever painting on canvass. Later, his painting would be exhibited in the “Antiguo Jovellanos de Gijón”. 3) The first work done using “Spray” techniques for the Archbishopric of the Cathedral of Oviedo. In 2008, this piece was moved to the Museum of Fine Arts of the Sanctuary of Covadonga (Museo de Bellas Artes del Santuario de Covadonga). 4)	The painting of the largest hyperrealist portrait in history. The image is courtesy of Spanish Futbol (soccer) player, David Villa and the painting will be sent to the official Guinness World Record at the end of 2010. The painting is 44 metres long and 5 metres high. For obvious reasons, many of the works of El Séptimo Crio will not be included in this webpage. Similarly, out of respect for privacy, various dates, names, places and third-party persons have been omitted. All of the murals and works of El Séptimo Crio are dedicated in their entirety to the innocence and moral purity of the children, the motivating force of Urban Art, and they serve as a reminder of the fact that the we are the only ones responsible and accountable for moral decay, with our globalized society and its materialistic teachings.